This level has medium difficulty. 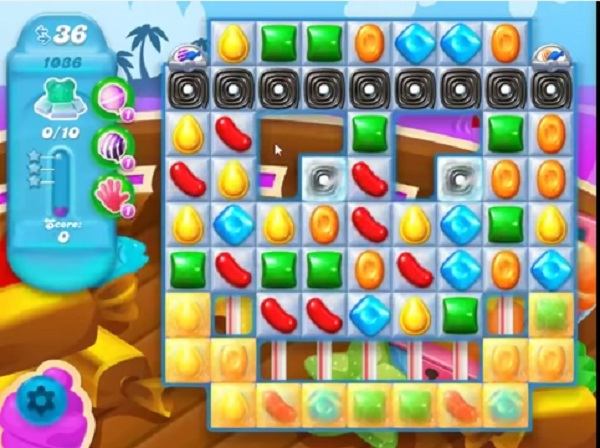 For this level try to play from middle part of the board to shuffle the candies and make special candy as you get the chance. Combine them with each other or use more striped candy to break the blockers that are in corner. Or play with near to remaining snow blockers to break them to find the bears. why actual game has 25 moves? Why do I only have 25 moves, and not 36?? I think is different playing on mobile and console, have different moves in the beginning, I just sent a mail to king.com asking why, sorry for my english. Only 25 moves its impossible! Why does the walk through have 36 move? 3 weeks on this level, I used all my boosters (I don’t like to use them) and I can’t beat this level, with 25 moves it is impossible, fck this level. Cheating, why we have only 25 moves where as you have 36 moves. If you are expert you should have only 20 moves. Disgrace. Suppose to motivate and encourage people to play, you give players frustration only. 1) not enough moves with 25 2) the ONLY reason it’s hard is because the fish NEVER go to the bottom 3) have yet to make combos even playing from the middle of the board 4) BORING AND NEEDS TWEAKING 5) can’t reach goals!! Agree with above… even with boosters I cannot get to the bottom row..beyond frustrating. King is at it again..greedy king. I only have 25 moves! Why is this???? I have been on this level for over 2 weeks and I have tried everything. This is VERY FRUSTRATING!!! And no fun for sure! Please send me some help or I am deleting this game. It’s near impossible. Maybe with 36 moves!! Why do I only have 25?? ?